A dense, slowly spreading sedge. The grass-like leaves are dark green with creamy white edges. It is evergreen in warmer climates. 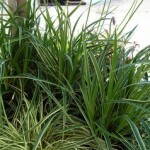 Useful as a ground cover, to edge a shrub border, or in mass plantings. It prefers part shade to shade and moist to wet soils. A selection originally found in Japan.